Her work focused on 17th- and 18th-century art, and the ways in which people think, talk, and theorize about art. Another theme of her work was the shift, since the 17th century, in how people think about the amateur. Lichtenstein has taught at the University of California at Berkeley, the University of Paris X-Nanterre, and at the University of Paris IV - Paris-Sorbonne, among other places. She has published numerous articles in French and American journals. She is the joint director of a philosophy and sociology training and research unit at University Paris IV-Sorbonne, where she coordinates a master’s program in aesthetics and philosophy of art. She is also in charge of the series "Essays on art and philosophy" (Aesthetics and philosophy of art), founded by Henri Gouhier in 1949 and published by Editions Vrin. Henri Gouhier was a French philosopher, a historian of philosophy, and a literary critic. A central theme of Lichtenstein's work is the reception of color by various disciplines, such as philosophy, art, sociology, and ethics. A focal point for her analysis was the antagonistic relationship between color and the notion of the design or plan of a work (in 17th-century French, the dessein of the work, etymologically related to dessin, drawing). Philosophically suspect due to its material character, morally culpable because of its seductive luster, color, in Lichtenstein's view, has long been deemed aesthetically dangerous, the source of a pleasure and a beauty that does not, at first blush, seem connected with the True and the Good. This is, she argued, one aspect of an ongoing conflict between reason and the universe of sensible forms. Painting not being reducible to drawing, it is a source of disunity and disorder in our systems of knowledge, one which elicits an experience of "lack" (insuffisance). The history of this conflict, she argued, begins in Platonic thought, which condemns color and rhetoric equally. The arts of speech and those of imagery are thus definitively linked. A central later figure is Roger de Piles, the leader of the Rubenists, the partisans of color (coloris). The Rubenists broke with the Platonic tradition and defended illusion, makeup, and seduction. They shifted, Lichtenstein maintained, the focus to those feminine aspects of representation, that is the suspected and cursed elements. They made these the essence of painting. Roger de Piles was a French painter, engraver, art critic and diplomat. From that point onward, painting was linked with the linguistically inexpressible. Only the gaze may be spoken of, not the picture itself. This, argued Lichtenstein, was the birth of aesthetics, in the sense that the word was to take on in the 17th century. La couleur éloquente, rhétorique et peinture à l'âge classique, Flammarion, Paris, 1989. La tâche aveugle : Essai sur les relations de la peinture et de la sculpture à l'âge moderne, NRF Essais, Paris, 2003. La peinture, Larousse, Paris, 1995. Tadanori Yokoo, co-authored with Daido Moriyama and Takayo Iida, Actes Sud, 2006. Conférences de l'Académie royale de Peinture et de Sculpture : tome 1, volume 1, Les Conférences au temps d'Henry Testelin 1648-1681, ENSBA, Paris, 2007. Conférences de l'Académie royale de Peinture et de Sculpture : tome 1, volume 2 : 1648-1681, ENSBA, Paris, 2007. Étienne Gilson was a French philosopher and historian of philosophy. A scholar of medieval philosophy, he originally specialised in the thought of Descartes, yet also philosophized in the tradition of Thomas Aquinas, although he did not consider himself a Neo-Thomist philosopher. In 1946 he attained the distinction of being elected an "Immortal" (member) of the Académie française. He was nominated for the Nobel Prize in Literature. Pantheon-Sorbonne University, also known as Paris 1, is a multidisciplinary public research university in Paris, France. It focuses on the areas of humanities, law, political science, social sciences, economics and finance. It is one of the thirteen inheritors of the world's second oldest academic institution, the University of Paris — colloquially referred to as the Sorbonne —, shortly before the latter officially ceased to exist on December 31, 1970, as a consequence of the French cultural revolution of 1968, often referred to as "the French May". The double origin of the founders is now found in the name of the university: Panthéon for law and Economics, Sorbonne for humanities. Jacques Bouveresse is a philosopher who has written on subjects including Ludwig Wittgenstein, Robert Musil, Karl Kraus, philosophy of science, epistemology, philosophy of mathematics and analytical philosophy. Bouveresse has been called "an avis rara among the better known French philosophers in his championing of critical standards of thought." Sandra Laugier is a French philosopher, working on moral philosophy, political philosophy, philosophy of language, philosophy of action and philosophy of science. She is currently a full professor of philosophy at the University of Paris 1 Panthéon-Sorbonne, a Senior member of the Institut Universitaire de France, and a scientific deputy director at the Institute for Humanities & Social Sciences at the French National Centre for Scientific Research, after being a professor at the University of Picardie Jules Verne in Amiens until 2010. Catherine Perret is associate professor of modern and contemporary aesthetics and theory at Nanterre University. She obtained her Ph.D. in philosophy and is known for her work on Walter Benjamin, most notably by her book Walter Benjamin ou la critique en effet. Dr. Perret was the director of the Art of Exhibition Department at Paris X. She served as a program director at the Collège International de Philosophie from 1995 to 2001. She is a recipient of the prestigious title Chevalier des Palmes académiques. Dr. Perret is currently responsible for the Centre de recherche sur l'art, philosophie, esthétique at Paris X.
Étienne Souriau was a French philosopher, best known for his work in aesthetics. Jean-Michel Berthelot was a French sociologist, philosopher, epistemologist and social theorist, specialist in philosophy of social sciences, history of sociology, sociology of education, sociology of knowledge, sociology of science and sociology of body. Gwenaëlle Aubry is a French novelist and philosopher. Pierre Francastel was a French art historian, best known for his use of sociological method. Eugène Dupréel was a Belgian philosopher. He has been professor at the Université libre de Bruxelles from 1907 to 1950, teaching logic, metaphysics, greek philosophy, moral philosophy and sociological theory. He developed an ethical theory and a theory of knowledge deeply influenced by sociology, and worked closely with the Institut de Sociologie Solvay. Leader of the "École de Bruxelles", he had a major influence on the argumentation theorist Chaïm Perelman and thus has been instrumental in the renewal of rhetoric. 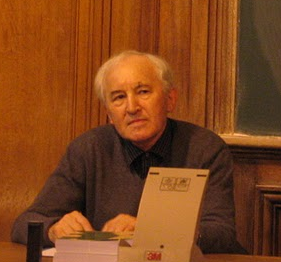 René Hubert was a French historian of philosophy and educational theorist. Émile Lasbax was a French philosopher and sociologist of the early 20th century. François Dagognet was a 20th-century French philosopher. Hippolyte Gevaert or Fierens-Gevaert was a Belgian art historian, philosopher, art critic, singer and writer. ↑ "Disparition de l'historienne de l'art, Jacqueline Lichtenstein". Connaissance des Arts (in French). 2019-04-05. Retrieved 2019-04-05. ↑ Jacqueline LICHTENSTEIN - Université Paris-Sorbonne pdf "Jacqueline Lichtenstein. Professeur des universités, 17° section. UFR philosophie-Sociologie. Directrice adjointe de l'UFR de Philosophie-Sociologie ..."
Unit for training and research in philosophy and sociology at the University Paris IV-Sorbonne. Records in the university system documentation, Paris. Barbara Cassin is a French philologist and philosopher. She was elected to the Académie française on 4 May 2018.